I LOVE a good treasure hunt. I mean, who doesn't? Clued In Kids let's you have the fun of putting on a treasure hunt for your kids without having to do all the thinking and work for clever clues. We got to try out a few version of the treasure hunts for "kids of all ages". First we got a series of ones that help kids with their multiplication tables. It has 5 treasure hunts and each one focuses on a different number. 2x,3x,4x,5x, and 6x. 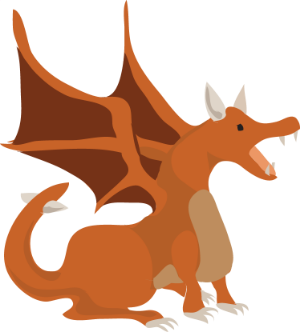 They are called Multiplication Dragons. The other fun one we got to try is the Gluten Free Treasure Hunt. .....has Celiac Disease and we are still trying to figure out what things we can feed her that doesn't have gluten. But, we still aren't sure what we can feed her, so, having some things on hand that she can actually consume will be a good thing. Having a greater understanding, by my littles, of what things they can offer her is good too. I am sure she is getting tired of them saying, "Do you want ____________? Wait! Does it have gluten?" And, now, if she turns them down, they will understand the "why" behind her answer and not just have their feelings hurt. 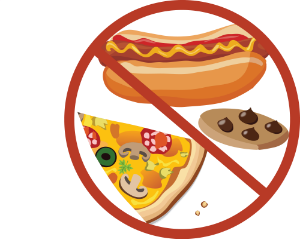 So, this fun little 12 clue treasure hunt even taught me a little bit about gluten and why some people's bodies respond the way they do when they eat it. The wheat we eat today is not the wheat our grandparents ate. Through cross-breeding and genetic engineering, since the 1950's scientists have been changing wheat to make it hardier. It is estimated that 5 percent of the proteins found in wheat today are new to the human body. This may be another reason why more people than ever are having trouble digesting gluten. You can read a little bit about the creator (Helen Bertelli) very personal reasons for creating her Gluten Free treasure hunt and the Happy Tummy treasure hunt. Now, for the treasure hunts themselves. It is super easy to start. All you do is download your hunt and print it. There are 2 clues per page, so you just cut the page in half. Then, you read where you need to hide them. Hide the clues...including their treasure. Keep the cheat sheet for yourself. Hand the kids the first clue and off they go. They are awesome for numerous reasons. The first being.....seriously.....who doesn't like a treasure hunt? Second, as a mom, I love having treasure hunts for the kids, but I don't always like the mental work required to create clues and figure out the best place to hide them. Third, even if I do get to that point in my treasure hunts, I don't think I have ever "taught" my kids anything (I do come up with a pretty clever rhyme here and there, though!). They advertise the set up time as being 8 minutes. I would agree with that for your first treasure hunt, but the time decreases once you get the hang of it, and aren't as nervous about screwing it up! So, we are down to about a 5 minute prep time here at our house! I also really appreciated the "Tips" section. The one that came in the most handy was writing a kid's name on top of different clues, so there wasn't squabbling about who got "to do" the clue when they found it. In my case, I was afraid A-man would beat everyone to the clue and have it figured out before S-girl and V-girl caught up. So, I went through and put his name on the harder clues and the girls' names on the easier ones. It worked great. There were almost no fights. The biggest fight was one time when there was a hidden picture and they were all trying to figure out what it was....which meant that they all wanted to be the one holding it. They ended up ripping the picture.....which resulted in a lecture from me on working together. We pieced the picture back together and moved on. One day, I had a treasure hunt set up, and when they were about 3 clues in, our neighbor boys showed up and wanted to do the treasure hunt too. I explained to them that they could certainly join in, but since I didn't know that they were coming, I didn't have enough "treasure" (treats) hidden at the end. They said they didn't care and joined in on the excitement. They had a blast helping figure out the clues, running from place to place looking for the next clue. But, even though I had warned them, they were sorely disappointed that they didn't get any of the bounty! I have promised them that the next treasure hunt I do, I will plan ahead and make sure I have enough treats for them too. I cannot describe to you the joy and excitement that being on the hunt caused for all the kids. The big kids and I were also smiling as we watched them tear from place to place. They had a blast. They ran from clue to clue...stopping only when they needed to really think or figure something out. I loved how my older kids took the time to teach/explain to the younger ones how to figure out the answer. Because, I mean, obviously, V-girl has not studied multiplication yet. It was interesting to hear them repeat some of the tips and tricks that Rainman and I have used in teaching them multiplication. Sneaky learning is the best, isn't it? 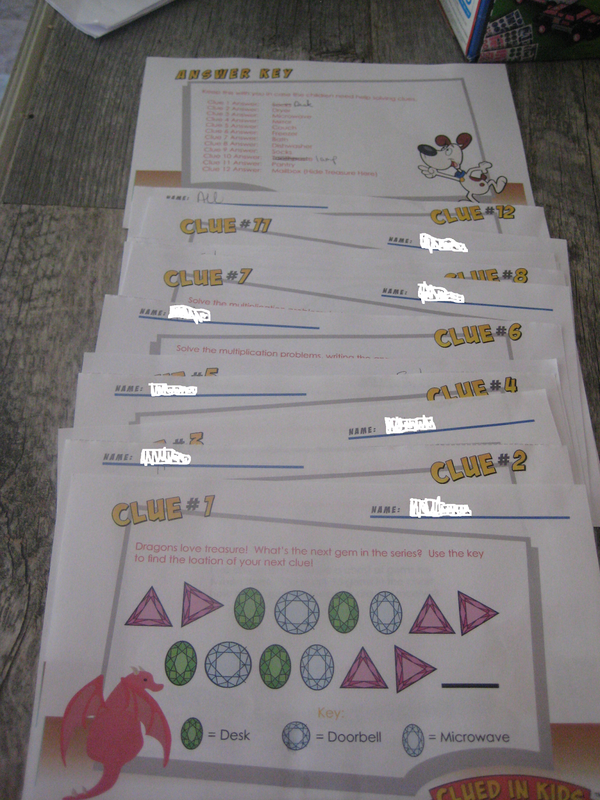 You can try out some of Clued In Kids awesome treasure hunts for yourself. The Gluten Free treasure hunt is $5.99 and the Multiplication Dragon series is $19.99. 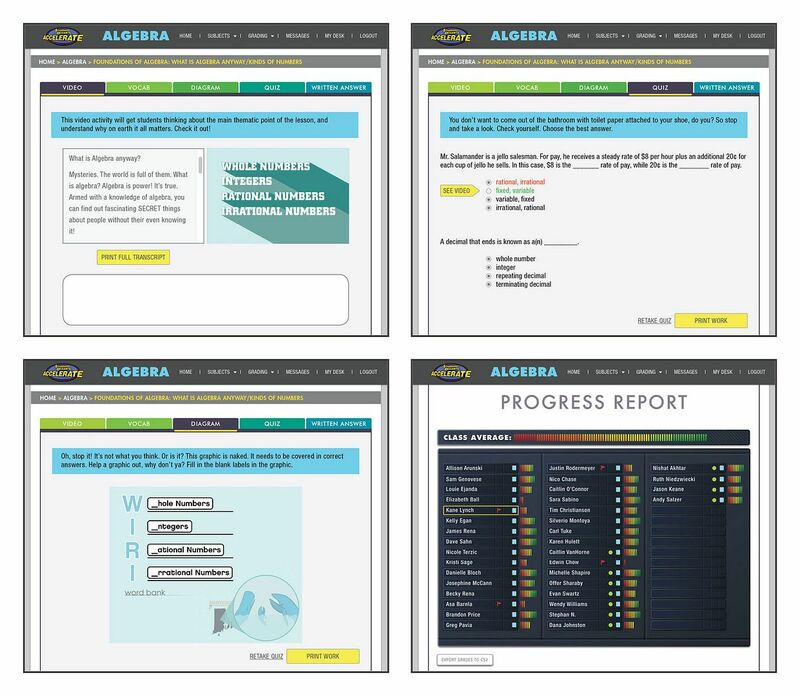 If you sign up for their newsletter, you get a copy of their Homework Reward Treasure Hunt, for free! We loved, loved, loved the Clued In Kids Treasure Hunts. Plain and simple. That is all. The TOS Review Crew got to try out some of their other treasure hunts, so go take a look at those and what they thought. There are seasonal ones, holiday ones, sports ones, plus all the educational ones. One of the easiest ways to incorporate something new into our school day is through a video. So, we were happy to try out New Liberty Videos DVD called Warriors of Honor - The Faith and Legacies of Robert E. Lee and Stonewall Jackson. Videos are especially looked forward to because we are still (mostly) doing the no T.V. during the week thing. This video is a documentary and covers some of the major battles of the Civil War, but it also gives some personal insight into the lives of Confederate generals Robert E. Lee and Stonewall Jackson, including the fact that they were both faithful Christians. I will admit that is something that I had never thought of before. I am not sure if it is because I grew up in the North (Minnesota), but there was always the mentality that the North were the good guys and that we were looking out for the slaves. On the flip side, the South were the bad guys that thought slavery was perfectly acceptable. Warriors of Honor showed me that it wasn't quite that clear cut, or forgive me....black and white....nor is it meant to "whitewash" the sins of the North.....or the South. I watched this with my three youngest, A-man, S-girl, and V-girl. It is about 80 minutes long, so we watched it in about 20 minute sections. There was some pretty heavy material in this. True, historical information, but, some was pretty heavy. The videos are for "general" audiences. So, there are probably some people that wouldn't want their children to watch this video, nor would they want to explain some of the content. Since moving from Minnesota to Georgia, some of these things we have discussed.....in very general terms.....already. But, I will admit, some of this documentary was difficult to watch....and....explain to the kids. Once they figured out what were "real" pictures and what were re-enactments, (The still pictures were real and the movies were re-enactments) I had some difficult conversations to have. There were quite a few disturbing scenes from the real pictures. Some dead men that looked very, very young. Not glamorized versions of war. But, real pictures of the men that fought this fight. Pictures of men that that were sons, brothers, and dads. That little fact right there sort of stopped the kids in their tracks. That was a real person, not an actor pretending to be dead, but a man that was somebody's dad.....laying in the field....dead.....and was never going to go home and see his kids again. This documentary is probably more suited to an older audience, but I am still glad I watched it with the little ones. They were shocked that there was a war, right at a church. The Dunker Church in Sharpsburg, MD. It was a horrible, bloody battle. My kids couldn't believe that they were just standing outside a church and shooting each other. The mind of a child, huh? I had never thought of it that way before. Yes, I had to have some difficult discussions about slavery, government involvement, and, even how Christians can be fighting a war on opposite sides....and still think they are doing the right thing. I found it sad that 17% of the soldiers from the North and 33% of those from the South died during the Civil War. Sad. This DVD also has bonus segments on Slavery (not just black people), Sam Davis (Brave...and the letter to his mother.....sigh....)and The Palmyra Incident (Uggg....horrible). I have a confession to make. We have lived in Georgia for 5 years. We have lived in the same town for that whole time. This statue has been there the whole time. We were in our town for the scarecrow contest, just happily strolling along looking at the funny scarecrows local businesses had put together for the contest. We had to walk through the center of the square, to get to some of the entries......and there he was. I have noticed it, but never paid much attention to it. Those who fell in fiercest fighting and sleep beneath the sod of every Southern state. Those who have passed away in the after years of peace, and whose ashes now hallow old Henry's Hill sides, Those who like a benediction, still limp in our our midst. May God preserve forever in our hearts, their memory and in all minds, a knowledge of their motives and their cause. It was interesting. It sort of brought it all home that the Civil War was real. That real battles happened near where we are living. The Civil War wasn't such a black and white issue. Warriors of Honor was a good supplement to our school. It would be a GREAT addition to a Civil War unit. While it will be most greatly enjoyed by your older children, especially those truly interested in history, even the ones who are bored by history will be able to find items of interest in the movie. It really made this Northern girl rethink a few things. It really did. You can get a copy of Warriors of Honor for $19.95. There are other videos available that other TOS reviewers watched. Take a look at what they thought of the other New Liberty Videos. This is the perfect movie for history buffs. I have discovered one thing that I like about NOT homeschooling my oldest two kids anymore. It is......getting their report cards. Not just the fact that I didn't have to grade all the tests and papers and then do the calculations to determine their grade (yes, we do that stuff in our homeschool). My favorite part of getting their report cards, isn't even their grades. However, I am proud to say that they are both getting straight, honest to goodness, A's. My favorite thing is actually reading the comments from their teachers. I mean, I think my kids are totally awesome, most of the time, anyway. But, to hear the things that their teachers say about them....especially when those things are good....is awesome. Makes this mom proud when a teacher says that they are always in the best mood after your kid leaves the classroom because of what they do and say (and, I might add, they aren't just the class clown, because they actually got an A in the class too!) Or that they are just plain and simple doing "amazing" work. My heart is happy when the word "stupendous" is used or when the teacher notes that it is evident that your kid has a "shrewd intellect" and now that they are participating more in class discussions that their opinion is respected by the whole class. 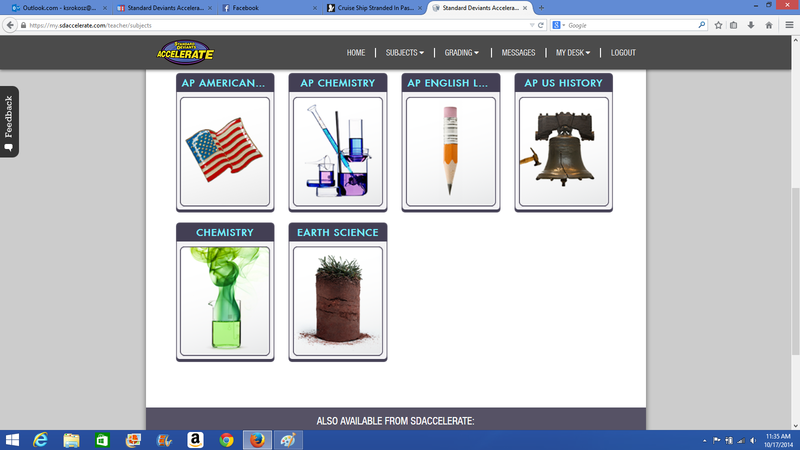 That my dear friends, is something that you don't get to see when homeschooling. A real picture of what the world is seeing from your kids when they are away from you. I am still a huge advocate of homeschooling.....and LOVE that I have gotten to do it for all of my kids until 9th grade. If any of the other 4 kids want to continue homeschooling through high school, I will make that happen and it will be awesome. But, I have to say, hearing teachers say incredible things about my oldest children has been awesome and unexpected blessing for me. Wow....was this a fantastic program to review! 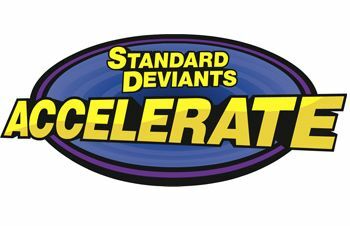 It is called Standard Deviants Accelerate. 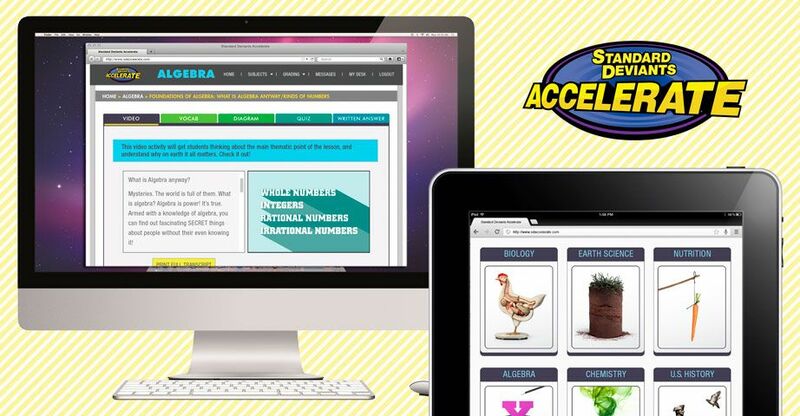 We got to try out an annual subscription to Standard Deviants Accelerate homeschool courses. But, the simpleness is deceiving. Did you notice that they have coursework for grades 3 through 12? And, really, a grown up could use these courses too. This is a totally on-line course. Yes, I will usually say I am not totally in love with my kids doing too much of their school while staring at a screen. But, I have to say, this one felt different. It didn't bother me that it was video based. One slightly different aspect to this video aspect is that next to the video clip is the total transcript of the script of what they are saying in the video. So, if you child learns better by reading, or any combination of listening, seeing, and hearing, Standard Deviants Accelerate has got your back. The information is in digestible chunks that won't overwhelm you. Primarily, L-girl was my guinea pig for this one. She started out with the Algebra course....which in our homeschool, she hasn't quite officially started yet. Quite honestly, Rainman and I had a disagreement about whether we felt she was ready to dip her toes into upper level (hard) math. Rainman didn't want to push her and scare her off, or give her the idea that she wasn't smart enough. I, on the other hand, thought she would enjoy the challenge and the ego boost she would get by doing hard math a little bit earlier than D-man and A-girl did. We were both a little bit right on this one. When she first started out, it was a little rough. She just kind of shrugged when I asked her about the lessons and mumbled something like, "Yeah, I sort of get it." She was scoring in the low 70s on her quizzes....which, for her, is very low. But, I asked her to commit to sticking with Standard Deviants Accelerate, at least for the review period.....and to not worry about it....this was just an experiment. She ended up doing a lesson everyday, rather than just the suggested 3 days a week. (that was the part I was right - she was challenged and didn't want to admit defeat!) I saw a big difference by the time she was done. I sat through a lesson or two to really watch and see what they were like and how she responded. I saw her wheels turning, connections being made and just generally getting a better handle on how Algebra works. The times I sat by her side and listened to a lesson too, I felt my own brain grinding back to life. After a lesson on x,y intercepts and slope value, I turned to L-girl and said, "You know what? I understood that! There were lots of steps to figure it out, but.....I got it!" Written answer - This is the only part of this that I have to grade the work myself. They do help out by giving me a rubric to follow, so I am not just flying blind. Before we started, I attended an on-line Webinar that explained how to set up classes for one or more of my kids, how the student would access stuff, how they took notes and saved them in their locker, and just in general how their whole program works. I liked it because even though I had already clicked around on their website, I still wasn't quite sure how everything worked. They explained things really clearly and I was able to ask specific questions related to K-girl and get answers. The webinar I attended was for a group of us moms/teacher. But, here is a tutorial for how their student accounts work. They explained things so well to me, that I was able to turn around and explain it to L-girl, but this would have come in handy if I hadn't had time for the webinar. Standard Deviants really had super customer support. They were open to questions during the webinar, we were encouraged to contact them if we had any issues or questions. It seemed genuine too. They seemed legitimately excited that we were going to try out Standard Deviants Accelerate with our kids. Like, they were excited and knew that we were going to love it. That kind of excited. They were right. We did love it. It was a really nice addition to our normal math. But, we could have just used it as our actual curriculum. In addition to L-girl working through Standard Deviants Algebra for 7th grade, I also had D-man take a look at their AP US History course. He is taking that at his school this year and a friend of his who had graduated a few years ago, recommended that he supplement the course a bit to make sure he did great when he took the AP exam at the end of the year. I have an AP US History book that he could have used too, but he opted to try out the Standard Deviants Accelerate video course. Overall, this is a really awesome course. Not sure if this is something that will work at your house? You can sign up for a free 6 month trial before you make up your mind. When you are ready to give Standard Deviants Accelerate in all their quirky goodness a try, the classes are each $99 for the year or $24.95 per month for each student. 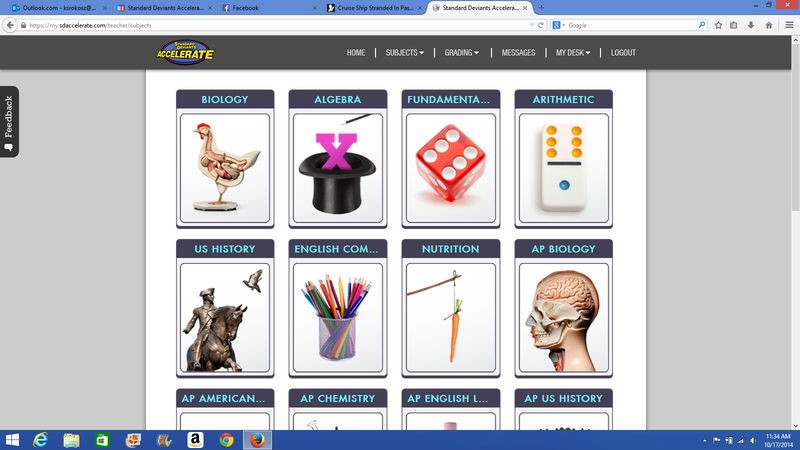 The AP classes are $14.95 per month per student. All the TOS reviewers got to choose whatever class/classes they wanted to, so take a look and see what they tried, and what they thought about Standard Deviants Accelerate. Guess Where We Have Been? We were in Hawaii! Maui, to be exact. Thanks to Rainman's job, we get to fly free....if there is room for us on the planes. So thankful for his job/company! We also, early in our marriage attended a timeshare presentation where I can remember us vividly sitting in our car in the parking lot before going in and looking each other in the eye and saying, "Okay now, we are going to say no to whatever they offer us, right? We are only here for our free prize. Agreed? Agreed." We walked out of there proud (shamefaced) owners of timeshare points. I had to be talked into this trip by Rainman....and eventually the kids too, were campaigning alongside him. I wasn't sure I wanted to plan on a vacation that involved 8 of us flying standby to a place that was about a 9 hour plane ride away from home....and then have to try to get flights home too. I wanted to go someplace closer to home....that wasn't quite as expensive once you got there. But, it worked and we didn't even have many troubles with flights. On the way there we all got seats....AND.....we all got seats next to each other. On the way home, we all got seats to LAX and then 7 of us got seats on the first plane home. I was left at LAX all by myself. Luckily, I caught the next plane. The beauty of that was two-fold. I was able to just sit and read and not have to worry about little people, or pass out gum, or any of that mom stuff on a plane. I did worry a bit because I wasn't with them....and they were spread all over the plane and not together, but they did great....Rainman said he even got compliments on how well behaved they were. The other great thing about me traveling on the next plane alone was that by the time I landed, Rainman and the kids had picked up our van and gotten all the luggage loaded....so I just walked out to the van and got in. I will spare you the details of how we got in......but, it involved a really high ladder and a hope that my sons were irresponsible. Spoiler alert: They were. I will post more pictures soon. 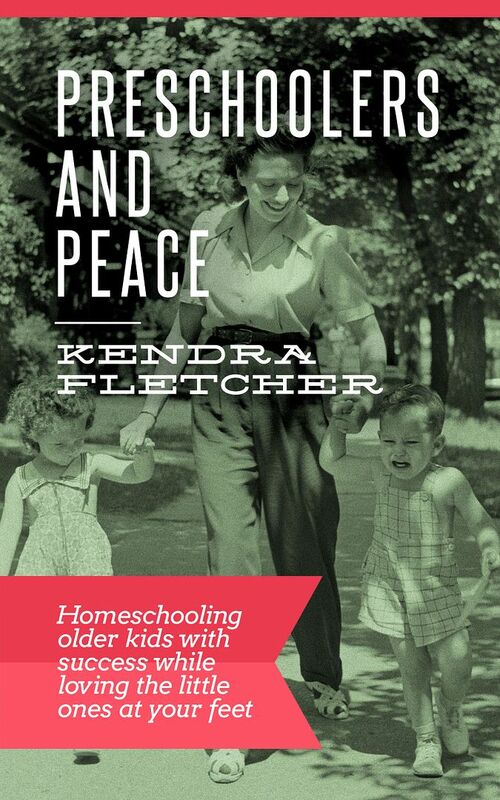 I got a chance to read a great e-book from Kendra Fletcher at Preschoolers and Peace called Preschoolers and Peace: Homeschooling older kids with success with little ones at your feet. This is a book that was just for me. Why does she need this book? She doesn't even have "little ones" anymore. I will admit that while it is technically true that I don't officially have little people running around here all day, I am still open to having little ones underfoot. With this e-book, I figured I would brush up on some helpful things....just in case. Besides, Kendra Fletchers Circle Time e-book has been one of my favorites, and we still have Circle Time at our house. This book is full of practical ideas for keeping your little ones busy while you go about the management of your house, AND homeschooling your older kids. You will not just be killing time either. But, it can be a total success. Ms. Fletcher shares in this book how this has looked in her household. Things she has tried. Things that have worked really well. I will share a few of her ideas. Ms. Fletcher shares the importance of preparation. Yes, the general ideas of being organized and having all the stuff you need for school, scheduling, lists, but also personal, prayerful preparation. When you have little ones around, you need to think through your day. When is naptime? When will they need to eat? Can we do this part of school with them or not? Once you have thought through what you need to get done and what that will mean for the littler ones in your household, you can make your plan. As homeschoolers, we always have a plan, but, I have learned (and Ms. Fletcher agrees) over the years that we need to be flexible and not rigid when it comes to that plan. 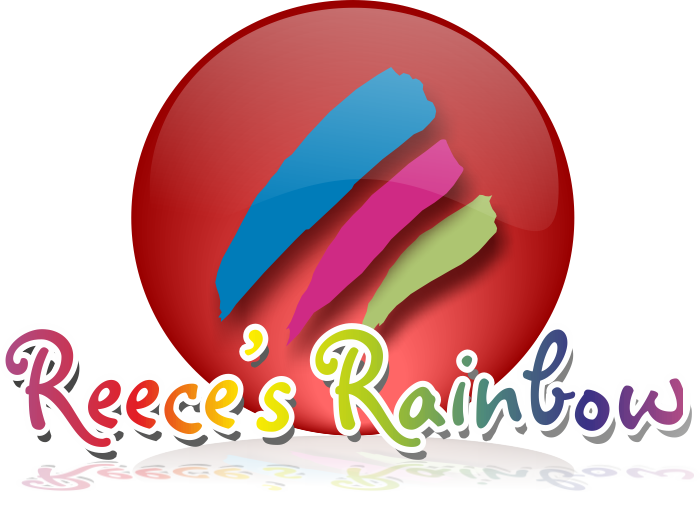 She gives you a huge list of suggested activities and things for your little ones to do. The ideas range from room time/crib time to creating certain days for your big toys. The room time/crib time is just what is sounds like....learning to spend time in their room or bed....quietly entertaining themselves. Creating certain days for big toys is just keeping them stored away out of reach and then, for example, on Monday they get a certain thing, like, Lincoln Logs, Tuesday, they get the farm set, Wednesday, they get the trains, etc. A lot of her ideas just simply made me look around my house and think differently about what I have laying around that could be utilized in this way. Happily, she didn't just depress me in this chapter about how many things I messed up by not doing, she is also encouraging and gives ideas of how you can do some of these things....even with little ones. I mean, let's face it, your life can't just stop if you have little ones. You still need to do things. You still need to have fun. You still need to go to the store. You still need to get school in. You still need to fix things around the house. Ms. Fletcher, with all of her ideas, and what has worked for her, just makes all of those things much more doable. 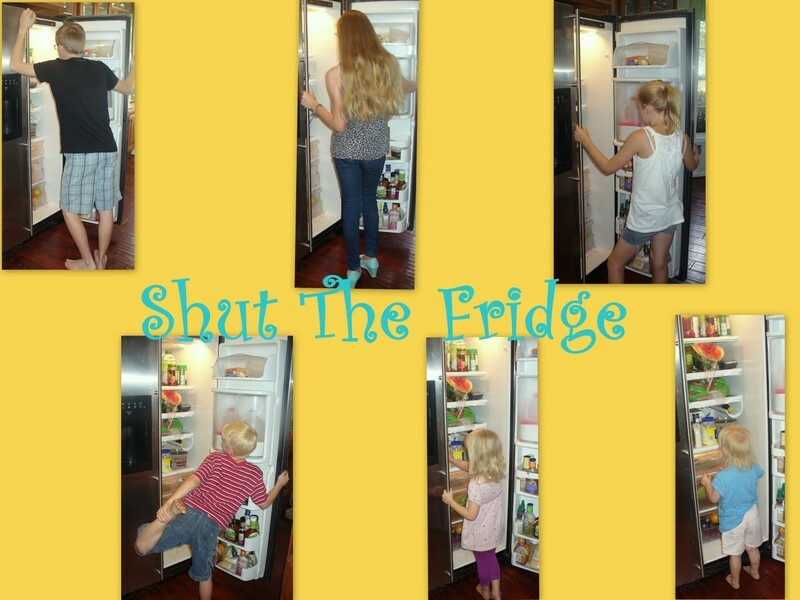 I like her approach for including the littles as much as possible in most things going on around your house and life. Yes, I like it because that is what our approach has been. We keep the kids involved in the mess of our lives. To me, it is one of the coolest parts of homeschooling. If we go to the store, I don't get a sitter or even an older sibling to keep the littes at home. We all went. There are a plethora of things that are good about this. Too many to name here. The positives of this way outweigh the negatives of the trip taking a bit longer. I think it is sort of funny that she has a chapter in her book dedicated to....boys....preschool boys, to be specific. Anyone that has a son knows why they need their own chapter! She gives real life examples of why preschool boys need their own chapter and stresses the importance of having enough activities planned to fill their time....or face the consequences....which usually involves lots of clean up....from their curiosity! She even has a chapter for you moms that only have preschoolers right now. She gives advice on how to keep your sanity and come out the other side with joy. One more things from the book that I loved before wrapping things up. I love that she talks about chores. Yes, chores for your little ones. I am not sure if I had chores when I was really little, but my kids do. I think it is important, and I think kids are capable of doing a lot more than people usually give them credit for. To help get your thought process rolling about possible chores around your house, she lists chores that her own kids have done at various ages. You get the idea. All things that they can do. Yes, initially it does create more work for you, but in the long run, it is great training for more advance chores and bigger help around the house. The bottom line is that I really loved this book, and Ms. Fletcher's approach to life, with children. No, I don't have any littles around right now. But, I will once again be refreshed and ready for any little ones that God may bless us with, because of the great ideas in this book. Remember, we still use Ms. Fletcher's Circle Time at our house. Here are the titles of her chapters just to give you a little more insight into what this book contains. How Do I Keep Them Busy? What Does a 2-Year-Old's Day Look Like? How Do I Get Any Preschooling Done? What Does a 2-Year-Old’s Day Look Like? You can get a copy of this e-book for $2.99. If you have littles, I almost want to say that this book is a "must buy"......but I am afraid that I would sound too much like a commercial. But, it is a really, really good book, with lots and lots of great ideas for helping you through the baby and preschool years. See what other TOS Reviewers thought of Preschoolers and Peace.